The official months of summer may be over, but I refuse to think it’s fall yet. I’m simply not ready to say goodbye to long sunny days, starry firefly nights, and soaking up as much natural Vitamin D as possible. I hate to admit this, but I spent more time working than I did making memories this summer. But, the quality of memories were top notch, and more than made up for the lack of quantity. This week’s ScrapMuch? Sketch-y Friday reveal features a layout of photos from one of my summer highlights. I seriously rushed home from the event, printed photos on my Selphy and scrapbooked them just in time for the reveal upload deadline. 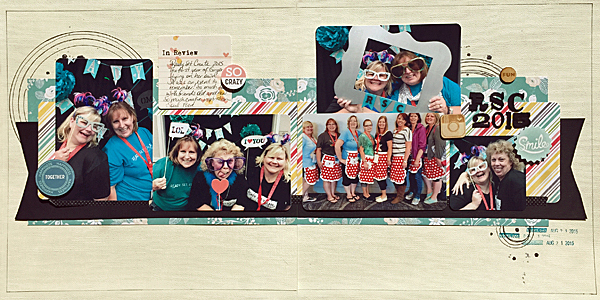 I went to an amazing scrapbook event called Ready… Set… Create… in Burbank, CA in late August. It was an amazing weekend of scrapbooking, inspiration, learning, reconnecting with friends, and meeting amazing new friends. So. Much. Fun. Oh, and the late summer California sun didn’t hurt either. Supplies used: CS – American Crafts; PP – October Afternoon; Embellies – Tim Holtz, Evalicious, Heidi Swapp Color Shine; Pens – American Crafts; Stamp – Dear Lizzy for American Crafts; Circle Tool – EK Success; Ink – Stash; Washi – Stash. I have no idea why my camera kept picking up a woodgrain like finish on the cardstock. I used my circle cutter as a template to just draw the circle elements. I went for a little bit of outlining just to help pull the drawing element through the page. I also tried to keep with the event theme colours in the papers so there’s teal in the floral patterned paper, some black cardstock to anchor everything, and a polkadotted washi because my group name was the Polka Dots. So fun! So now it’s your turn! Hop on over to the ScrapMuch? blog and see what the rest of Team A has created for your inspiration! Take a shot at your take on the sketch and share it with us by the end of the month for a chance to win an amazing ScrapMuch? prize! As always I can’t wait to see what you create! Have a wonderful long weekend and I hope you find some time to be crafty! Fabulous layout Tiiu for a fabulous event! Looks like so much fun! Wow, you rocked this sketch love those photos too!